We collect the following personal information from you. We will share your personal information with third parties only in the ways that are described in this privacy statement. We do not sell, rent, trade, or otherwise share your personal information with third parties without first providing you notice and choice. We reserve the right to disclose your personal information as required by law (e.g., to comply with a subpoena, warrant, court order, or legal process served on our website) and when we believe that disclosure is necessary to protect our rights, protect your safety or the safety of others, investigate fraud, and/or respond to a government request. 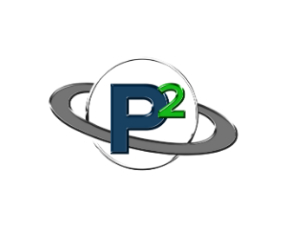 In the event Paracord Planet goes through a business transition, such as a merger, acquisition by another company, or sale of all or a portion of its assets, your personally identifiable information will likely be among the assets transferred. You will be notified via email and/or a prominent notice on our website of any such change in ownership or control of your personal information, as well as any choices you may have regarding your personal information. You may opt-out of receiving our newsletter or marketing emails from us by following the unsubscribe instructions included in each newsletter email. You can find how to turn on cookies by selecting the Help option on the toolbar of your internet browser. On most browsers, it will guide you through the process of accepting new cookies, notifying you of cookies, disabling cookies and modifying settings. 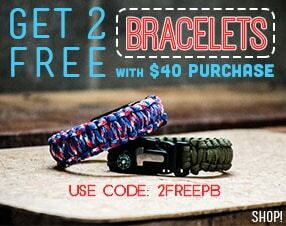 Paracord Planet uses Remarketing with Google Analytics to advertise and gather ad impressions online. Third-party vendors, including Google, may show our ads on sites across the Internet. We and third-party vendors, including Google, use first-party cookies (such as the Google Analytics cookie) and third-party cookies (such as the DoubleClick cookie) together to inform, optimize, and serve ads based on someone's past visits to our website. We also utilize 3rd-party audience data (such as age, gender and interests) with Google Analytics. To opt-out of Google Analytics for Display Advertising and customize Google Display Network Ads, click on Ads Settings. You may also click here to prevent your data from being collected by Google. As is true of most websites, we gather certain information automatically and store it in log files. This information may include internet protocol (IP) addresses, browser type, internet service provider (ISP), referring/exit pages, operating system, date/time stamp, and/or page views. We use this information, which does not usually identify individual users, to analyze trends, to administer the site, to track users' movements around the site and to gather demographic information about our user base as a whole. A web beacon is an electronic image placed on a web page that can serve many of the same purposes that cookies serve, For example, recording the pages you visit on our site. We or third parties may use web beacons to track the traffic patterns of users from one page to another. To review and update your personal information to ensure it is accurate, contact us at orders@paracordplanet.com. 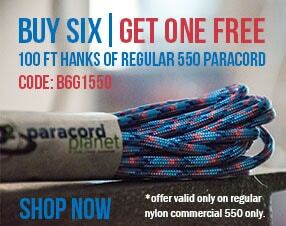 Our site includes links to other websites whose privacy practices may differ from those of Paracord Planet. If you submit personal information to any of those sites, your information is subject to their privacy statements. We encourage you to carefully read the privacy statement of any website you visit. Our website offers blogs or community forums to allow you to learn more about us. You should be aware that any personally identifiable information you provide in these areas may be read, collected, and used by others who access them. We are not responsible for any personally identifiable information you choose to submit in blogs, forums, chat areas, instant message services, bulletin boards, or any other publicly accessible service or website. If you have any questions about security on our website, you can contact us at orders@paracordplanet.com. We may update this policy from time to time as our information practices are modified or changed. If we make any material changes to this policy that affect your personal information, we will notify you by email (sent to the e-mail address specified in your account) or by means of a notice on this Site prior to the change. We encourage you to periodically review this page for the latest information on our privacy practices.